‘Answering the call to end poverty: A path toward peaceful and inclusive societies’. This is the United Nations’ theme for International Day of the Eradication of Poverty. And the Westin Cape Town commemorated this day by further enforcing its Serve our World value, established specifically as a means of giving back to those less fortunate in the city. International Day of the Eradication of Poverty was established in 1987 by the and was celebrated this year on 17 October. The day aimed to acknowledge the effort and struggle of people living in extreme poverty around the world. To demonstrate the Westin’s commitment to help uplift those living in poverty, the establishment supports various organisations through its core value SERVE. According to Leon Meyer, General Manager of the Westin, SERVE focusses on: Shelter and food, Environment driving sustainability, Ready for jobs, Vitality of children and Embracing global diversity and inclusion. “This day drew much-needed attention to the plight of those less fortunate in our country and around the world. We have a responsibility not only on this day but every day, to do what we can to help make a difference,” says Leon Meyer, General Manager at the Westin Cape Town. He says the hotel also supports centres for abused women and children, these organisations seek to encourage women to better themselves through various upliftment programmes to empower them to break free from that “vicious cycle” of abuse. “We are committed to changing the circumstances of the disadvantaged, especially our most vulnerable – women and children. The best way to do it is to support organisations that encourage skills development and upliftment through their campaigns. Together we can make the change that’s needed,” Meyer says. Meanwhile, the hotel’s TakeCare Canteen Challenge embraces the concept of ‘charity begins at home’. 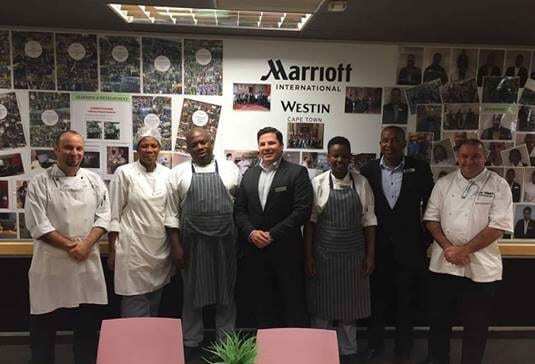 The TakeCare Canteen Challenge was launched in the 2017 version of Marriott’s annual Associate Appreciation Week as a way to give back to the associates and in order to improve the nutritional value and general quality of the Westin Cape Town staff canteen offering. The Canteen Challenge pairs chefs from various restaurants in the hotel into small teams and with the help of canteen staff cook-up a mystery box of ingredients for the staff to enjoy. A table of judges are appointed to judge, selected teams then progress to a second round and a similar challenge gets underway where finally, the winners then proceed to challenge other hotels within the region and franchise. “The chefs enjoy the opportunity to square up against more senior chefs in a ‘Master chef’ manner and to feel the pressure usually associated with more senior chef positions while the canteen cooks and associates are up skilled by participating, assisting, and observing advanced kitchen techniques and systems they otherwise would not be exposed to,” says Grant Cullingworth, Executive Chef at The Westin Cape Town. “TakeCare has been the driving force of The Westin Cape Town’s internal efforts since merging with Marriott and embracing our new core value to Putting People First. During this time we placed a high emphasis on associate wellness beginning with ‘me’ and ‘my colleagues’ with the belief that if we can incorporate physical and emotional wellness within ourselves as well as within our colleagues that ultimately we will succeed and our business will thrive,” says Laurie Meiring, Area Digital Field Marketing Specialist for Marriott, East/South Africa & Indian Ocean.